Successfully Added 2-in-1 Camera Connection Kit and SD Card Reader for iPad / iPad 2 to your Shopping Cart. Similar to the famous Apple iPad Camera Connection Kit, but improved with a 2 in 1 design and wholesale price! Compatible with the new iPad 2! Is this like the Apple iPad Camera Connection Kit on the Apple Store? The functions are the same, but our iPad Camera Connection Kit and SD Card Reader comes in a convenient 2 in 1 design, which means 1 less iPad accessory to keep track of! Of course, you also get our amazing wholesale price. Will this work the same way with an iPhone? No, this accessory is for the Apple iPad and iPad 2 only. Can I connect this to a web cam or use my digital camera as a web cam? 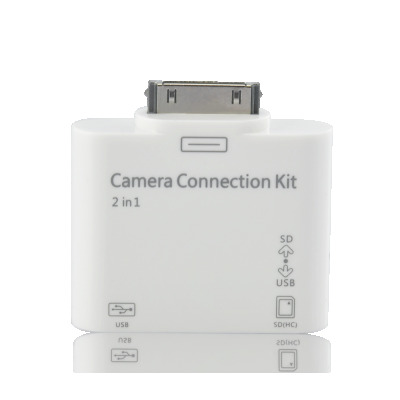 This iPad Camera Connection Kit can only be used to hook up your digital camera to import photos and video. It does not allow you to use the camera when plugged in as a camera for video chatting. The iPad is not picking up my USB flash drive, why? If your iPad does not detect the USB flash drive, try creating a folder called "DCIM" and move all your media files there. You should also make sure the switch on the device is set to USB (left side).